Affectionally referred to as the ‘Jewel of Jaipur’ and arguably the most luxurious heritage hotel in Jaipur, the exquisite Taj Rambagh Palace dates back to the early 19th century. 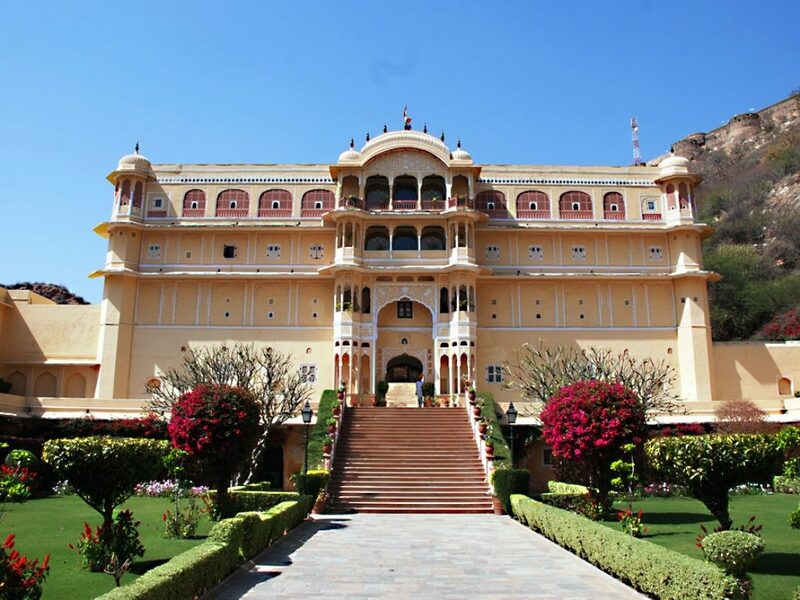 It served as the home of the Jaipur royal family until the late 1950’s. 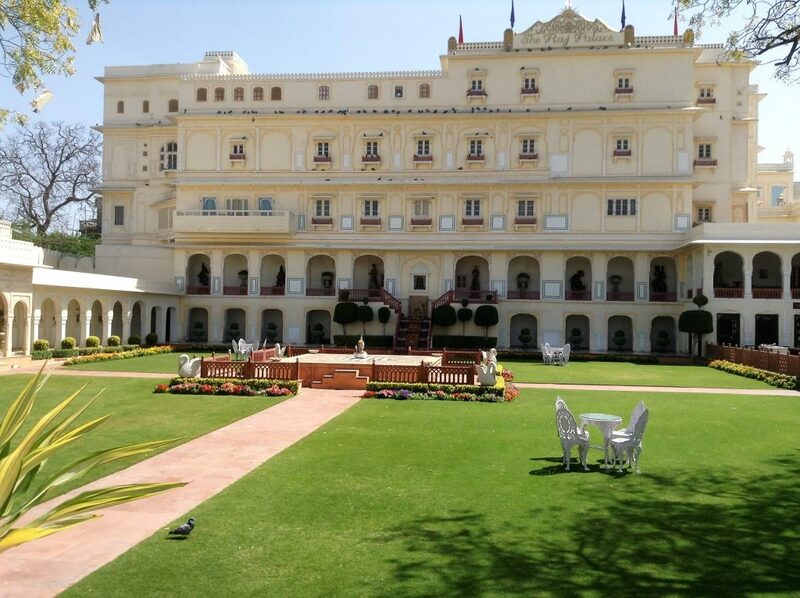 Now under the management of the Taj Group, the Rambagh Palace has earned a reputation as one of the finest luxury palace hotels in India. Recently, Travel+Leisure magazine declared it amongst their top 100 hotels in the world. 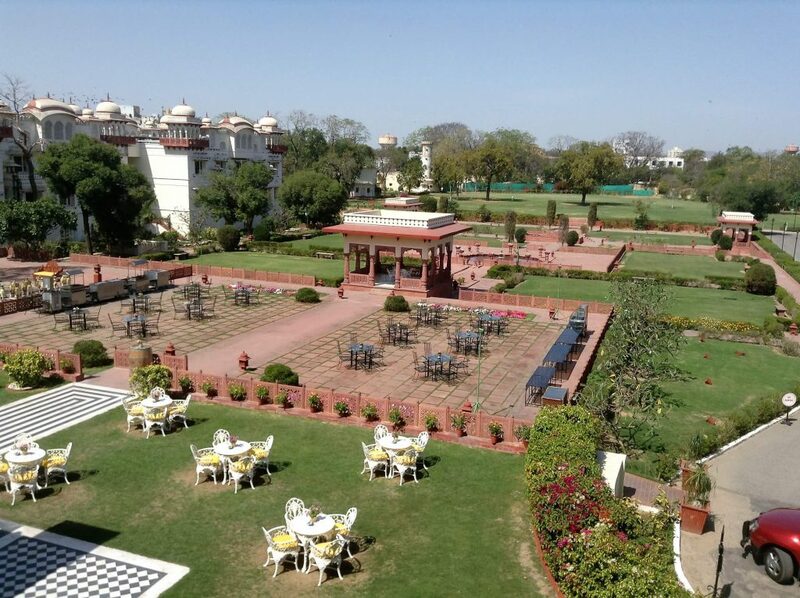 All rooms and suites at the Rambagh Palace are superbly comfortable and offering all the facilities one would expect from a five-star property. Sprawling across 47 acres of Mughal gardens, the Rambagh Palace boasts two swimming pools, a spa, five restaurants (one of which is housed in an old steam train! ), and no less than 78 stunning rooms and suites. 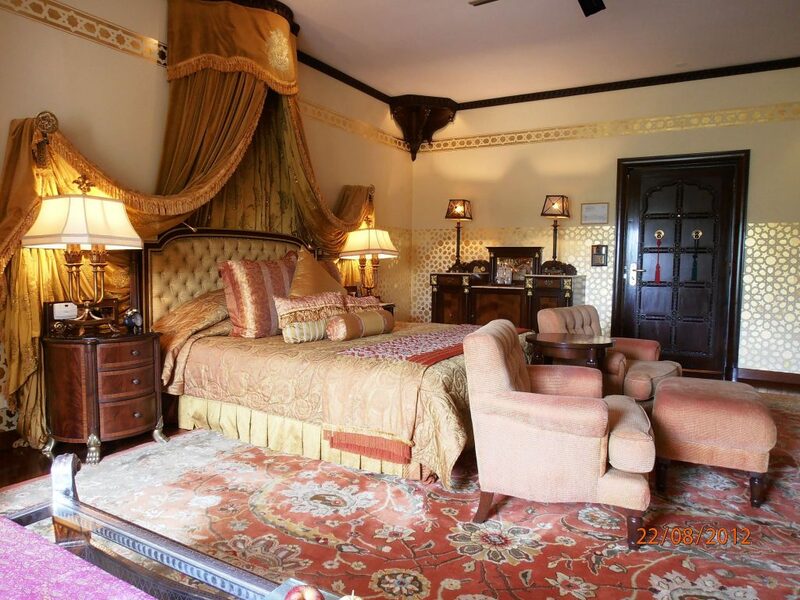 We’d recommend the Palace Room: 550 sq ft with a four poster bed, spacious bathroom and a view of the garden or the courtyard. Combine a stay at the Rambagh Palace with the Umaid Bhawan Palace in Jodhpur, and the Lake Palace in Udaipur, for the ultimate luxury Rajasthan tour. The Sujan Rajmahal Palace is one of the most exciting hotel additions to Jaipur for many years, though at over 250 years old one would be wrong to say it’s new. Originally built by the Maharaja of Jaipur as a pleasure garden for his favourite queen, the palace changed hands many times before landing in the lap of Sujan’s management, even serving a brief stint as the British Residence, before being thoroughly renovated in the 1930’s with an art deco style. It has also hosted many notable guests – including Queen Elizabeth II, Lord Mountbatten, and Jackie Kennedy – whom the delicious rooms and suites are now named after. Each room is completely unique and tells its own story. The bespoke motifs and colours reinforce the room’s individual theme, particularly in the (46 different types of) custom-made wallpaper. It’s unlike any other of the heritage hotels in Jaipur and reinvents the concept. The Royal Heritage Haveli dates back to the 1700’s when it was built by Madho Singh Ji of Jaipur. This is one of the more intimate and tasteful heritage hotels in Jaipur, offering a small number of well-appointed suites, each boasting charm, character, and local flair. The Royal Heritage Haveli is nestled within lush gardens and makes for a peaceful oasis away from the bustle of the Pink City. The friendly owners and resident Basset Hounds provide a personalised and welcoming experience. 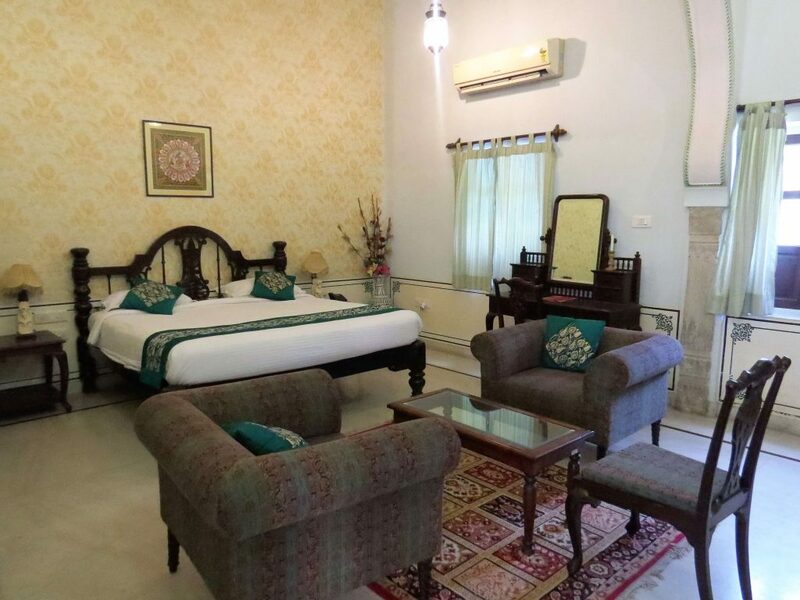 Samode Haveli is a popular choice for heritage hotels in Jaipur, offering the opportunity to stay in a true haveli full of history and character. 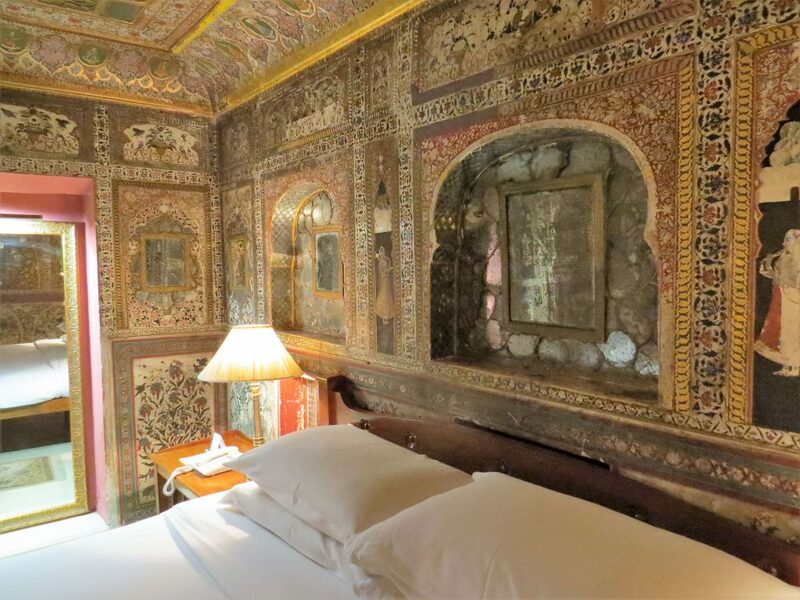 The property retains a number of original features, particularly in the Sheesh Mahal suites which are adorned with exquisite mirror work and wall paintings, and the hand-painted frescoes around the dining room. 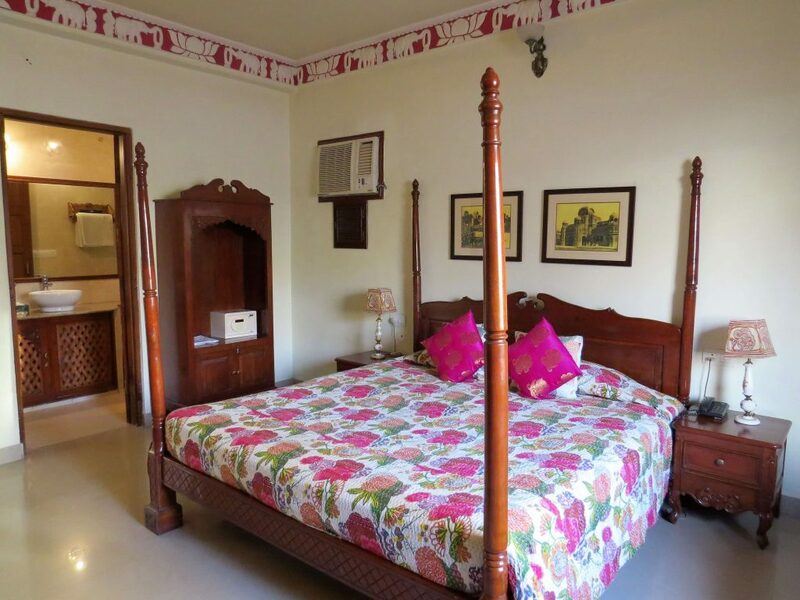 Rooms and suites at Samode Haveli are laid out in a traditional manner, around a square courtyard. There are lots of nooks and crannies to explore within the complex, and the central location within the walled city is ideal for those who like to explore further on foot during free time. On the outskirts of Jaipur, tucked away within the Aravalli hills, Samode Palace will take your breath away. It’s a stunning example of Indo-Saracenic architecture and boasts some of the finest craftsmanship around; from the hand-painted frescoes to the glittering mirrored mosaics. Dating back almost 500 years, Samode Palace is bursting with stories to soak up, and interesting corners to explore. The surrounding villages and lanes are lovely for strolling around. Spread across almost 20 acres of stunning manicured gardens, the beautiful Jai Mahal Palace dates back to the mid 18th century. 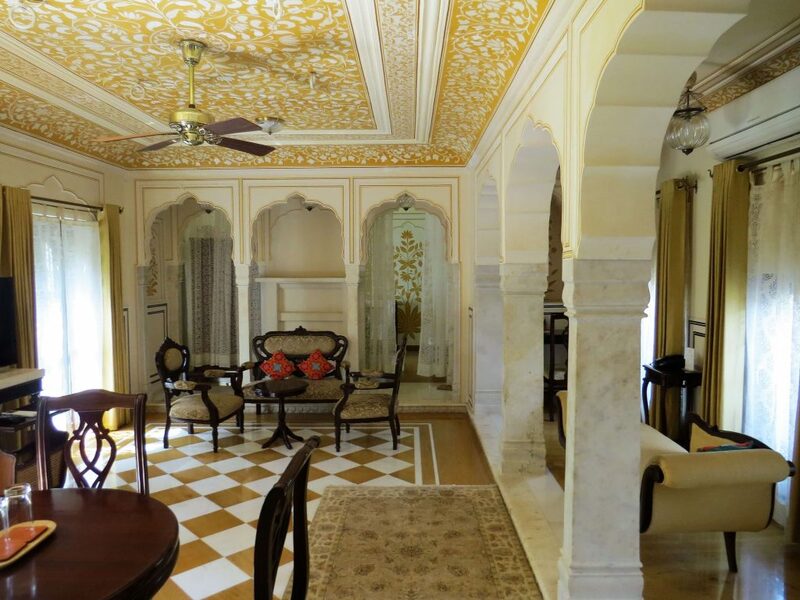 A fusion of both Rajput and Mughal architectural styles, the palace blends Indian grandeur with modern comforts, inviting you to experience the life of a Maharaja and his Maharani. The palace is centrally located within easy reach of the main sights and shopping areas. We’d recommend the Luxury Rooms with Private sit-out, which – as the name suggests – boast a charming private garden to relax in, enjoying a sundowner and reflecting on your day. A former royal home, Raj Palace was built by Thakur Mohan Singhji of Chaumoo, then prime minister. The stunning, award-winning Raj Palace hotel, just north of the city wall on Amber Road, overlooks a splendid courtyard and has a range of individual and atmospheric rooms featuring splendid decoration and luxurious furnishings. Interestingly, the dining hall is home to the world’s largest chandelier! This is one of the quirkier heritage hotels in Jaipur and will ensure a unique, if not eclectic, experience. Dera Rawatsar is a charming little haveli in Jaipur, blending traditional Rajasthani décor with modern comforts. Vibrant local textiles bring a pop of colour to the rooms, and tasteful traditional furniture ensures a cosy and authentic feel. An intimate courtyard, swimming pool and garden provide a peaceful area in which to relax with a drink, unwind, and discuss the day’s sightseeing with other guests. The property is adorned with a number of interesting antique pieces that the Rawatsar family have collected over the years, now on display for guests to admire. Okay, this one is not one of the heritage hotels in Jaipur in a traditional sense, though being built in the style of a traditional Rajput fort the Oberoi Rajvilas exudes local flair and the royal opulence of yesteryear, and is steeped in the romance of Jaipur’s rich heritage. 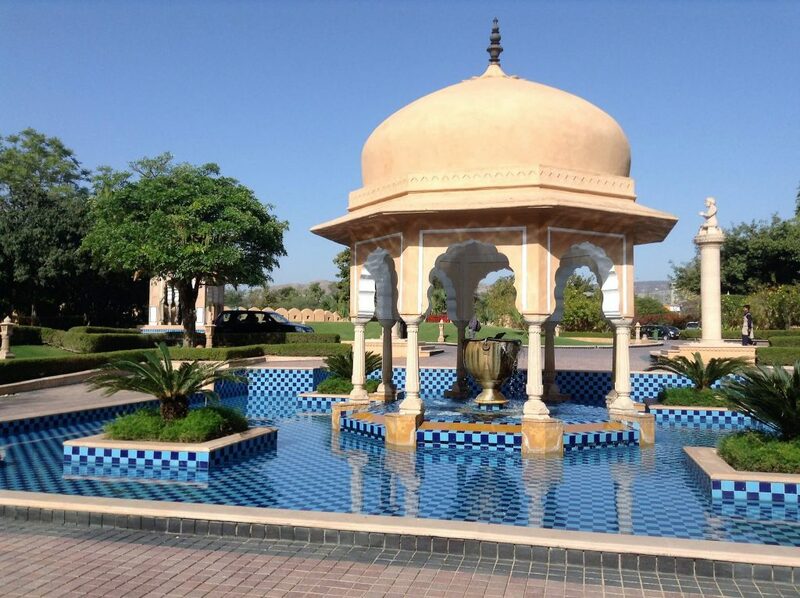 Sprawling over 32 acres of beautifully landscaped gardens, the Oberoi Rajvilas offers all the facilities one would expect from an Oberoi, including a fully equipped spa and incredible service. 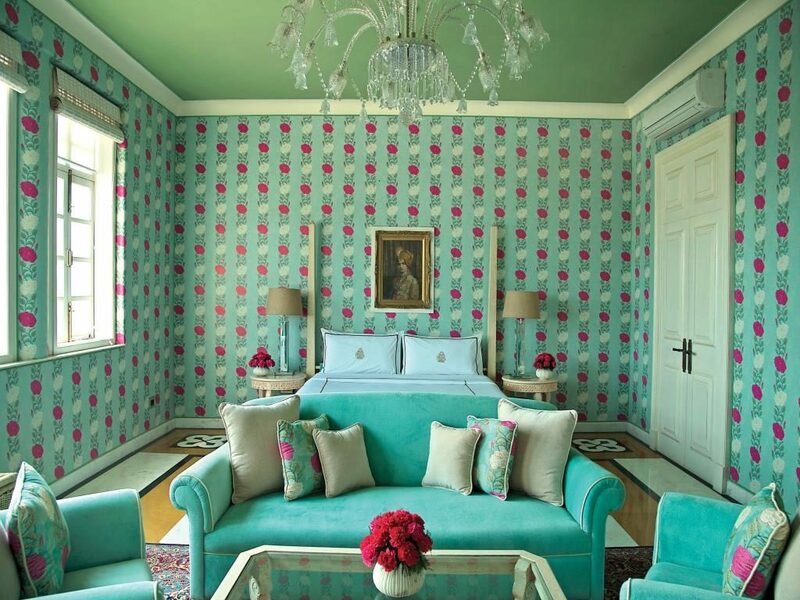 For those seeking a truly dignified stay in Jaipur, there is arguably no better place to be completely indulged. If you’d like to experience a stay at one of our Top 10 Heritage Hotels in Jaipur, please do get in touch. 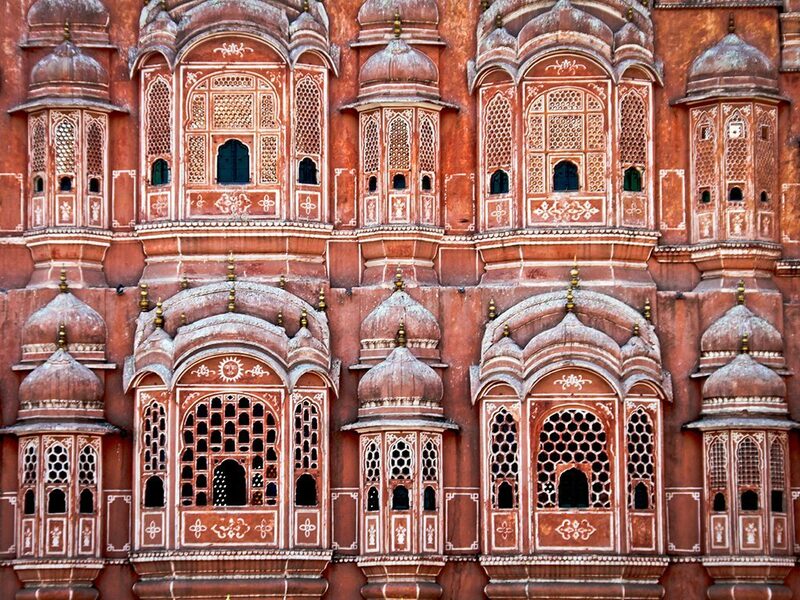 As experts in tailor-made tours of Rajasthan, we’d be an ideal fit to create your exciting Indian getaway. Every detail would be designed around you, to suit your tastes, schedule and budget.